Do you wonder at times if your beloved feline companion is happy? Well, you’re in luck! 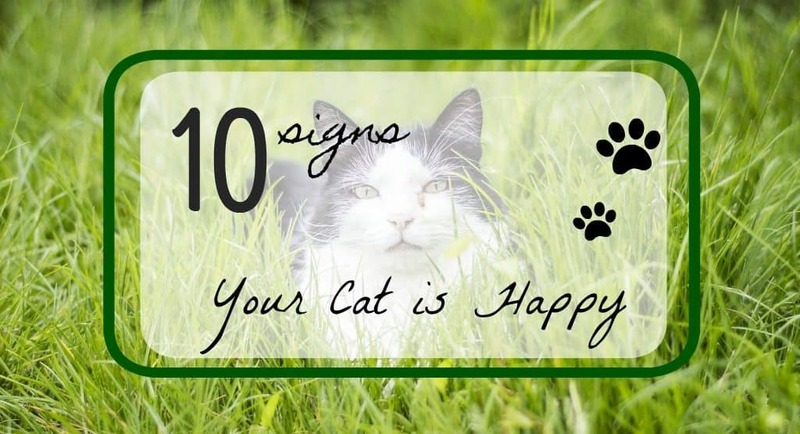 We’ve got 10 ways to tell if your cat is happy for you right here! Do you wish that your cat could tell when they are happy? Chances are that your cat is already communicating with you. You just don’t know the language that your cat uses. Cats are very communicative with their people. They just use body language, meows, and other forms of communication to tell you how they’re feeling. Check out these ten cat behaviors that cats use to express happiness. If your cat has any or all of these behaviors you can be confident that your cat is a happy cat. Purring is the form of cat communication that most people are familiar with. No one really knows how a cat purrs but in general cats purr when they are happy. But cats can also purr as a way of soothing themselves when they are in pain. 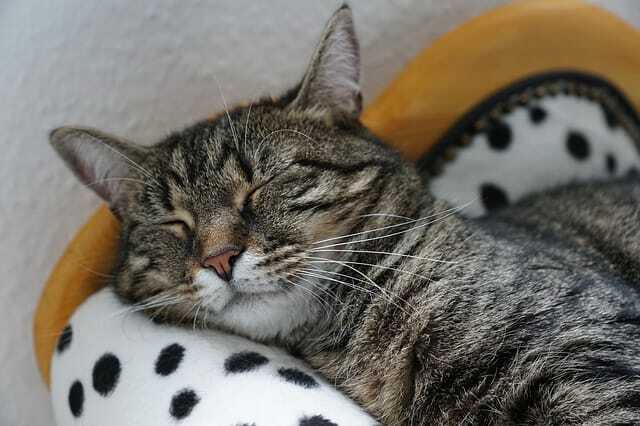 If your cat is relaxed and seems content and is purring it’s a sign that your cat is happy. If your cat purrs when you pet it or snuggle with it that’s definitely a happy purr. A cat that will confidently walk around the home, lounge in the middle of the floor, or claim the softest pillow on the sofa is a happy cat. When cats are scared, depressed or unhappy they will crouch down small and look for places to hide. They may not come out for days. 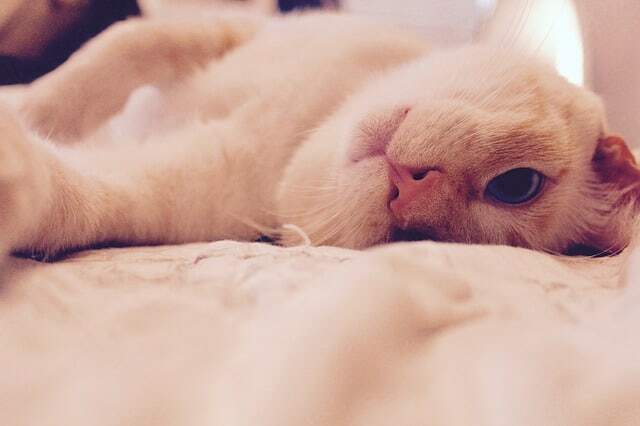 Even if your cat isn’t overly affectionate if your cat follows you around the house, takes up as much of the surface area of your bed as possible, or likes to sit in the living room with you and your family your cat is happy. Happy cats feel safe and secure and show it by owning the space around them. Whether that space is your lap or a patch of sunlight on the floor if your cat is owning the space you can be sure your cat is happy. Have you ever caught your cat looking at you, then blinking, and then looking away? The “slow blink” as it’s called is an expression of love and contentment. 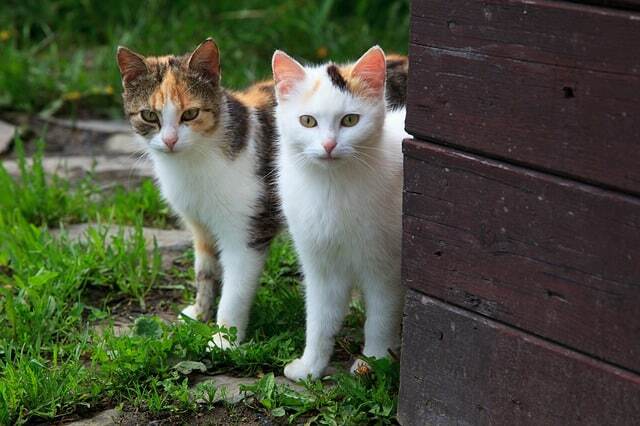 Cats slow blink to other cats to show that they are not a threat. They slow blink at humans to show love and affection. A cat that isn’t happy won’t be willing to show love or affection. When your cat comes into the room or when you enter a room your cat is in does your cat make a question mark with his tail? If you ever catch your cat “question marking” with his or her tail you can be sure that your cat is a happy cat. Just like the slow blink, a question mark tail is a cat’s way of telling you that it loves you and is happy. This type of tail display is sometimes called the “I love you” tail because that is what the cat is trying to communicate. Now when your cat whips their tail into a question mark when you are around you will know that the cat is trying to tell you how happy you make him or her. Read more about cat tail language in our pawticle here. Is there anything better than a good cuddle with your kitty? Your kitty doesn’t think so. If your cat loves to cuddle with you then you don’t have to worry about whether or not your cat is happy. 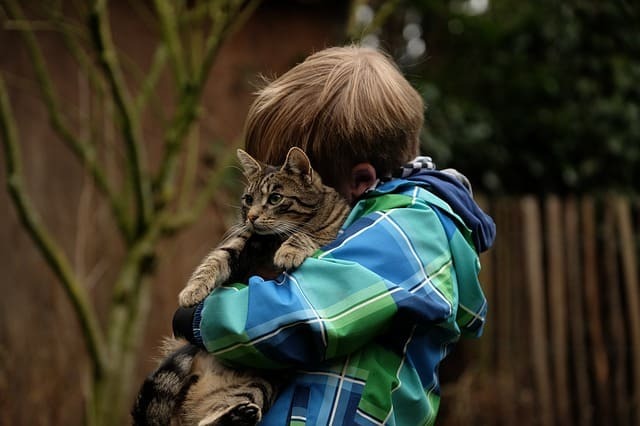 Cats that are unhappy or don’t feel secure in their space won’t ask for affection. Their body language will be tense and rigid, like they are just about to run away. A cat that is relaxed enough to cuddle is a cat that feels safe and secure in your home. Have you always wondered why your cat will get up on your lap and knead your lap, or your arm, or your leg? Cats knead to show happiness. They can knead with either their front paws only or all four paws. The short rhythmic kneading gestures are soothing to cats because they mimic the gestures that a kitten uses to get milk flowing from the mother cat. Often cats will purr while they knead. When a cat kneads you before settling into sleep you can be assured the cat is blissfully happy and feeling safe and protected. Does your cat give you head bumps? Your cat isn’t trying to knock you out when he or she bumps your face with his or her head. Sometimes head bumps are gentle. Sometimes they are pretty rough. But whether they are gentle or rough, head bumps are a sign of happiness. Your cat is letting you know that he or she loves you and appreciates you. They are also marking you with their scent and claiming you as their property. So the next time your cat bumps you in the head and you think the cat is trying to knock you out don’t panic. Your cat just really loves you. Many cat owners know what it’s like to wake up at 2 or 3 AM to the sound of a cat skittering across the floor, throwing catnip mice through the air, or racing at full speed from one end of the house to the other. Instead of being annoyed by these nighttime antics you should be glad that your cat is playing. 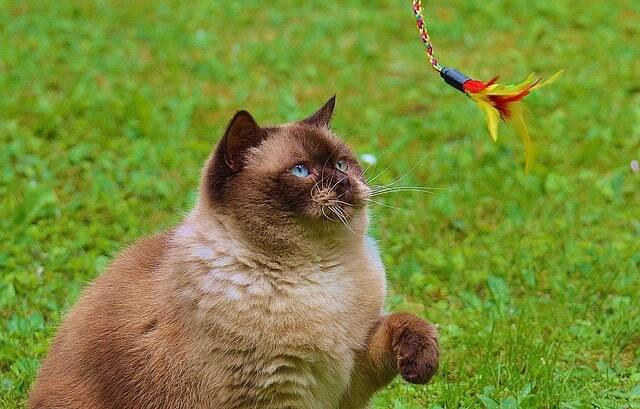 A cat that feels secure enough in the environment to play is a happy cat. Cats who are scared or worried will hide and not play. Meowing is something that cats only use to communicate with humans. Cats don’t meow to communicate with each other. Your cat trusts you and feels comfortable enough with you to try and communicate with you. So if you think that your cat understands you when you talk to it and meows back at you to have a conversation you could be right. Cats are independent. They like being on their own. So if your cat is choosing to spend time with you or with other pets in the household you can be sure the cat is happy. A cat that doesn’t want to socialize and hides in a closet or under the bed for hours or days at a time is not a happy cat. But a cat who likes to be around people or other pets is a happy and well-adjusted cat. 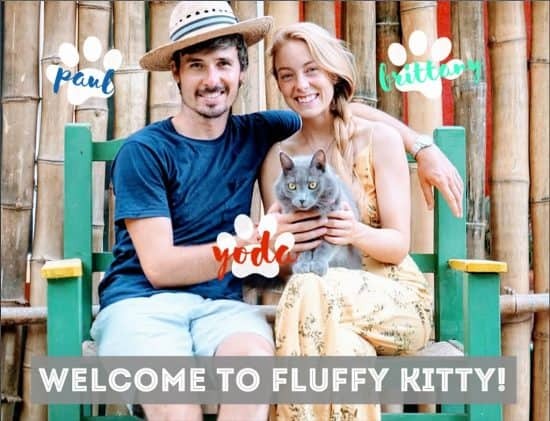 So, is your kitty a happy feline? We hope so! What are some other ways you can tell if your cat is happy? Do let us know in the comments below!!! We know that each kitty is unique in their own way so many things could make them happy. Thanks for reading, please subscribe / follow / and share our blog with your family and furiends! Cat Tail Language: What Is Kitty Trying to “Tail” You? Loulou is happy because of all the above, and thank you for the list!! But we know she is happy especially when she flops down on her back and throws her paws in the air, and throws back her head, exposing both her tummy and he throat. Now THAT’S a trusting kitty. Awww, how nice to hear! That’s a cute sign! Yoda rolls around on the floor or strides proudly towards his guests to show off his regal fur, hahah 🙂 Thanks so much for visiting us Suzanne et Loulou. Talk soon! Ink-Pet Personalized Pet Portrait + GIVEAWAY! !